"Many serious critics waste needless time and energy trying to justify their intellectual curiosity regarding things pop," writes SALON's Allen Barra in a review of Clive James' recent collection of biographical essays, CULTURAL AMNESIA: NECESSARY MEMORIES FROM HISTORY AND THE ARTS. "[But] James, who made much of his early reputation covering television, bites into the pop cultural hot dog with unapologetic relish." Clive James was born in Sydney, Australia in 1939, where he was raised by his mother after his father was killed in a plane crash returning from a Japanese POW camp during World War II. He sailed to Britain in 1961 where he attended Cambridge University, excelling in numerous extracurricular activities, including ascending to the Presidency of Footlights, a popular comedy troupe. In Britain, he soon gained esteem as a television critic for THE OBSERVER, for which he wrote for 10 years, until venturing into the television world himself. In 1993, he released FAME IN THE TWENTIETH CENTURY, a PBS series examining film and television stars in the last 100 years, and in 1995, he brought us his innovative travel series, POSTCARDS. Despite television notoriety in Britain, James maintained his work in the literary medium, writing more than 20 books, essays and portraits in the coming years. His most recent collection of biographical essays, CULTURAL AMNESIA, which took him 40 years to accumulate, covers 106 cultural figures stretching from Duke Ellington to Adolph Hitler, all of whom James believes are most worthy of being remembered by generations to come. Who do you think is worthy of remembrance? Talk back on the Blog. In further hope of lessening "the amnesia gap," James has recently launched a Web site, which he describes as "somewhere between a space station and a free university campus." The site features video, audio, and writings, by him and others, designed to help users connect the cultural dots, so that past battles and grievances are appropriately heeded. 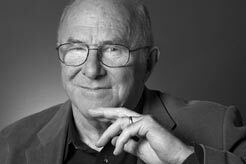 Clive James was made a member of the Order of Australia in 1992, awarded Australia's premier award for poetry, the Philip Hodgins Memorial Medal, in 2003, and in 2006, was made an Honorary Doctor of Letters by the University of East Anglia. He currently lives in London and Cambridge. According to James: "Somewhere between a space station and a free university campus, the machine is now embarked on its true voyage, dedicated to the premise that values can be stable and permanent, even when they are packed into a dot in the middle of nowhere, where nothing weighs anything and all the signals move at the speed of light." Watch selected interviews by James with important cultural figures, including Cate Blanchett, Ian McEwan, and Martin Amis. What Kind of Car Is a Ford Madox Ford? "James is a natural master of the art form in which 'serious delivery avails itself of comic timing.' It is a form that isn't often brought to bear on journalism and letters in this country; but lucky for him, James is not from this country." Bill Moyers interviews culture critic Clive James, whose latest book CULTURAL AMNESIA comes after more than 40 years observing and commenting on arts, literature, culture, and politics. Read the latest opinions on the potential purchase of Dow Jones by News Corp, find out the FCC implications, and tell us what you think on the blog.